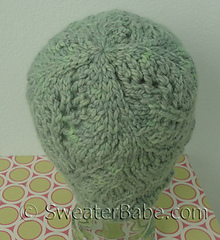 Pattern Gauge: Approx 10 sts = 3” 7.5 cm and 13 rnds = 3” 7.5 cm in Leaf Lace stitch. Charm personified in a hat! 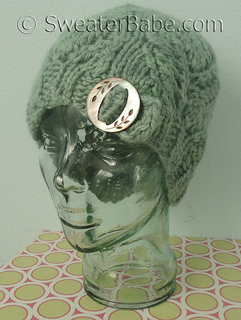 This lovely lace hat is knit with just one-ball of incredibly soft chunky 100% baby alpaca yarn. 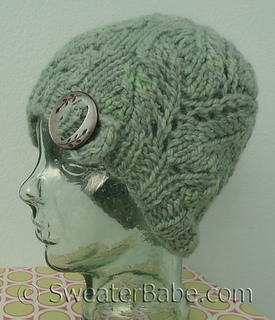 It’s a quick project, knit seamlessly in the round, with lots of great details. The leaf lace stitch is a pretty contrast to the 2x2 ribbing and works beautifully with the subtle color variations of this hand-dyed yarn. The button tab detail adds a whimsical accent. For the sample, instead of a button, I used a vintage shell buckle from my stash. The leaves on the buckle echo the lace pattern so nicely. 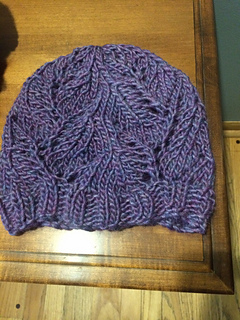 The hat is shaped at the top with just a little bit of slouch to give it a more modern fit! 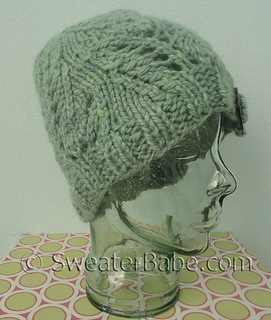 This is a very feminine hat that makes an ideal gift knit. On the page 4, work through Rnd 31, not 32. The table should end with Rnd 31. Therefore, all the remaining Rnd numbers are off by 1 and the last Rnd should be Rnd 41.